My Bookshelf is the area within BrowZine where you can organize your favorite journals so that the current issue is one click or tap away and so that BrowZine can help you stay up to date in your field! Choose the "Add to My Bookshelf" button when viewing a journal to add that title to My Bookshelf. You can then organize my bookshelf by moving the journals between multiple "shelves" and "bookcases" as well as renaming the shelves and bookcases to whatever you'd like! Then, when you login on any device this configuration will automatically sync to that device and display red bubbles indicating that you have new articles available in that journal. What is the BrowZine Account? The BrowZine Account is the system used to provide personalization features throughout the BrowZine ecosystem. Having a BrowZine Account is required for using My Bookshelf on all devices as it is used to tie together your iPhone and Laptop for example so that you only need to configure My Bookshelf on one device or the other (or both!) and the configuration will sync seamlessly between the devices. The BrowZine Account is available on the mobile devices for all users with mobile access and at BrowZine.com for libraries who have subscribed to this feature. 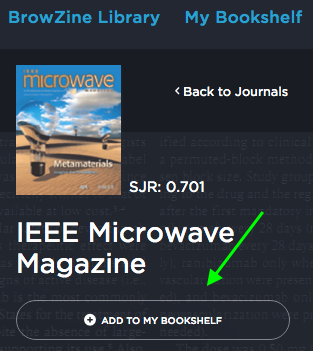 If you do not see "My Bookshelf" in the title bar for your library at BrowZine.com, then your library has not yet added this option to their subscription. If you think this is in error or would like to add this feature, please contact us and we would be happy to assist! What email can I use to create my BrowZine Account? Does it matter? In most cases, you can use any email you would like! For libraries using the BrowZine Pairing Service, you may be restricted to using only your university/company email address. BrowZine will alert you to this fact if you try to use another email at one of these accounts automatically. Do I have to have an account? Can I use BrowZine at all without one? No, you do not have to have an account to use BrowZine. You can still browse the shelves, look up titles, read tables of contents, and download articles. However, in order to use the personalization feature of My Bookshelf and My Articles a BrowZine account is required so that we can synchronize and back-up your data across all devices and ensure that we keep your device accurately updated. On the web at BrowZine.com, how do I see My Bookshelf and/or add titles to My Bookshelf? On the web you need to first login to your BrowZine Account to either see or edit My Bookshelf. To do this, simply click on the link for "My Bookshelf" in the menu bar and you will see a login link. If you do not see "My Bookshelf" as an option, then your library has not yet subscribed to this feature on the web. If you are interested in adding this, please contact us and we would be happy to assist. Then, when you navigate to a title you will see a new option available to you to add the title to My Bookshelf. Once you click this button the title will be added to the next available open slot on My Bookshelf. You can click back on the My Bookshelf tab to move this title to a new slot if you would like to personalize the organization of My Bookshelf.